the abrupt change in land use directly related to the systematic violence committed by Sudanese government and militia forces against the peoples of Darfur. In an agriculture-based society, this vegetation rebound resulted from the loss of livestock and the inability to farm, caused by human displacement and the destruction of subsistence resources from 2003 to 2007. 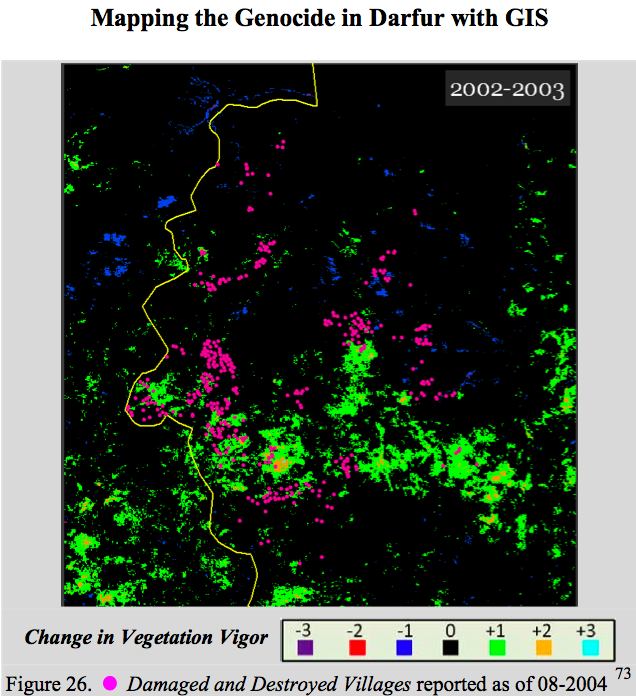 The Working Paper demonstrates that a direct correlation exists between the displacement of local populations and the looting of livestock, as depicted in the rebound of vegetation coverage and vigor. To be sure, the returning vegetation is not a result of intensified agrarian activities but of depopulation. it is possible to study the influences of climate and land use on a fragile environment using remote sensing applications. For future research into the prevention of genocide, these types of applications can be useful in understanding and quantifying the factors contributing to environmental strains that can cause violence associated with competition for diminishing resources. If preventive measures can be implemented and enforced based on an understanding of these factors, it might be possible to avoid acts of genocide. This was in fact the underlying motivation behind my work on the Horn of Africa’s Conflict Early Warning and Response Network (CEWARN), which monitors cross-border pastoral conflict. Recognizing that tracking political, economic and social factors was insufficient for conflict early warning, I turned to the regional organization’s Climate Prediction and Applications Center (ICPAC) for GIS data on vegetation, forage and rainfall; the assumption being that environmental factors influence pastoral conflict and therefore could potentially serve as early warning indicators. Preliminary statistical analyses of the data suggest that aggravating behavior, along with a reduction in peace initiatives and reciprocal exchanges, is associated with an escalation in pastoral conflict, particularly when coupled with an increase in vegetation that may provide cover for organized raids. We therefore recommend that conflict early warning systems integrate both response options and salient environmental indicators into their analyses to better deal with the complexity of the relationships between pastoral conflict and the environment in an era of climate change. P. Meier et al. (2007). “Environmental Influences on Pastoral Conflict in the Horn of Africa,” Journal of Political Geography, 26:716-735. One lesson to be drawn from the Yale study in terms of crisis mapping and prevention of mass atrocities is that we should redouble our efforts to pursue a more systematic and rigorous research agenda that focuses explicitly on multi-modal pattern analysis of proxy indicators. This entry was posted in Crisis Mapping, Satellite Imagery and tagged Satellite Imagery. Bookmark the permalink.